Holding the sense of I-Am is considered one of the most valid methods among traditional teachers. Those of us who have followed Self-Inquiry or Advaita teachings are well aware of the I-Am , especially after this method was advocated by the great Advaita Master Sri Nisargadatta Maharaj. You know that you exist — not as this or that, just simple existence — an existence without any reference to thoughts, names or forms. Now hold on to this feeling as your I-Amness. Keep coming back to this feeling and hold on to it at regular intervals. In time, with perseverance and dedication, the I AM will reveal itself and then, one day, it will finally disappear, leading you to your SELF. This is a simple and profound truth. However, in practical situations it does not prove very effective nor productive for achieving the goal. In fact, the results from this practice, when used exclusively, are very inconsistent and can often leave a practitioner confused as to why they experienced a ‘drop’ in their state, or cannot feel their joyous being which they were able to feel a few days before. The reason for this is due to the impurities collected at the gross, subtle, and subtlest levels at play within the I-Am feeling. It is important to understand that the I-Am feeling usually perceived by a practitioner is often a mixed feeling (awareness) of all the layers (koshas) at work within. These koshas have their energy, vibrations and codes which exert a ‘pull’ and influence over the Pure I-Am . Hence, when we abide in the sense of I-Am, what we are actually feeling and intuiting as our ‘existence’ is nothing but the totality of these koshas — and NOT the PureI-Am . These koshas are unreal, but still veil, conceal, and keep us from our real SELF. In fact, the practitioner will find that each day of practice brings forth a ‘feeling’ from a particular kosha, and it is that kosha that is experienced instead of the Pure I-Am (Anandamaya Kosha). 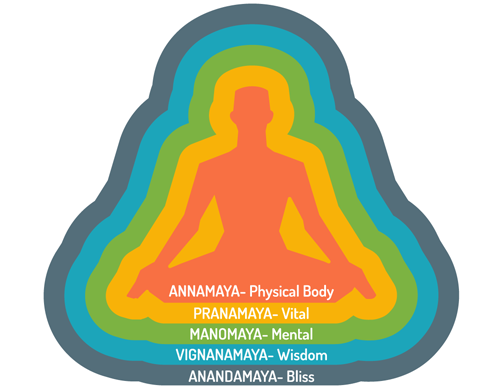 So, some days, body sensations (Annamaya) will predominate the seeker’s awareness. On other days, energies coursing through the body (Pranamaya) will prevail. Yet other days, visions, intuitive ‘downloads’, or messages from higher Consciousness (Manomaya) will be more prevalent. And on some rare occasions, a torrential flow of Joy in the Heart (Anandamaya) will captivate the seeker’s awareness. So the feeling of I-Am will vary. Sometimes the feeling of I-Am will be unstable, and progress will be inconsistent, depending upon the state of one’s mind. Often, when rare bliss (Anandamaya) is felt, it will quickly be disturbed by one of the four preceding koshas. This is because the practitioner has no awareness of how to control the workings of the preceding koshas. They have no awareness of the techniques available to control them quickly and effectively. This cycle will continue until a lot of effort, seeking, and ‘hunting of the I’ is done and enables one to finally transcend all the koshas and arrive at the final destination — the Spiritual Heart. Yes, it is definitely possible for all koshas to roll back revealing the SELF exclusively through holding theI-Am method, but it is like walking into a dark room not knowing what lies ahead. It is a very slow, tiresome and inconsistent method. Most often a seeker will understandably feel dejected and demotivated when they realize that they have practically no control over how they will feel in their meditation. That is why ‘holding the sense of I-Am’ exclusively as one’s practice of Self-Inquiry will not work for 90% of seekers (unless they have been a very strong meditator in this or past lives). The other problem with this method, apart from its inconsistency, is that one usually ‘peaks out’ relatively early and feels that they have ‘hit a wall’. There does not seem to be much headway or progress, and their state feels static. Nothing seems to be happening. They will feel much the same as they did a few years back. Remember, the great Nisargadatta Maharaj himself had to persevere with this method continuously, like a man possessed, for three (3) years. But such perseverance is rare to find in a busy, worldly life. Hence we need to use other methods along with I-Am to be able to sustain the state for deeper and longer periods of time. The reason is that there is no insight or importance given to purifying oneself. This is one of the biggest flaws of current non-dual teachings. They do not lay down spiritual principles or ethics aimed at an inner cleansing of the life-force (Prana) and nerves (nadis) dealing with habitual tendencies/projections/vasanas, and outer adherence of non-violence in thoughts, speech, deeds, etc. No matter how many times you dip a white shirt into dirty water, it will never come out clean. It will remain dirty. Similarly, no matter how many times you bring the mind to yourI-Am, it will still remain the same — unless you clean your koshas too (the layers that make up the I-Am). It is, probably, for this reason that Sri Ramana hinted that the Heart is the seat of Jnanam (knowledge) as well as of the granthi (knot of ignorance). The nadis (nerves) that connect the Heart to the brain, prana, and spine must be purified, otherwise they can easily mislead the practitioner away from the SELF and into a state of ignorance. It can be seen that those who abide in, or hold to, the feeling of I-Am as their sole practice usually do so at their Heart centre. As a result, it is not uncommon to witness these practitioners as being impulsive, unstable, reactive and predominantly driven by heightened emotions, even though they occasionally feel a sense of peace and love emanating from their Heart. The ‘high’ they experience in their meditation is often replaced by a new ‘low’, or depressive ‘gloom’, within a few days. The reason for this is that they have little control over the inner workings and influences generated by impure nadis. This reinforces the fact that purification is a must for stability and sustained abidance in Pure I-Am. That is why the correct way to practice ‘holding the sense of I-Am’ is to do it either in combination with a practice where the breath, prana and mind are relatively stilled, and kept suspended through either breath control techniques (pranayama), or by using Sri Ramana’s method “Who Am I?”, in both the waking state and the sitting meditation (where the breath is automatically controlled). Breath control is, relatively, an easier method to practice than Sri Ramana’s “Who Am I?”, where a subjective awareness of ‘I’ is often difficult to maintain and sustain. Hence, a fusion of both is needed for the best, most effective, and longest lasting results. It was from this perspective that the Implosive Self-Inquiry Protocol™ (ISIP) was designed — wherein holding the sense of ‘I AM’ is also accompanied by simple, yet highly effective techniques for removing and filtering the impurities of the distracting layers of koshas within the I AM. This provides each seeker with an instant glimpse of the real I AM, and enables him or her to sustain deeper and more stable abidance in the SELF.